A baker has created a miniature version of Bethlehem out of 36 fruit cakes to raise money for a school playground in her village. Lynn Nolan last year made a model of her Derbyshire village for charity. 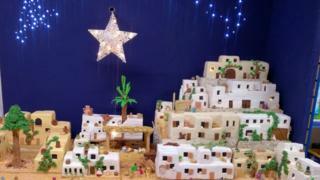 This time she spent five months and used 90kg of icing making the 6ft (1.83m) edible Bethlehem. Youlgreave Church of England Primary School is hoping to raise cash towards a £60,000 target when the cakes are auctioned. Children from the school and other villagers helped with the baking project. "We used 50kg of marzipan and 48kg of raisins, currants and sultanas and four litres of whisky," Mrs Nolan said. Last year Mrs Nolan made a tasty replica of Youlgreave out of cake. The cakes remain edible because they have been soaked in whisky, which preserves them, she said. "I've no (overall) plan to work with, it just happens as I go along. The only thing I have is the picture in my head, so I've got to go with that," she said. The models are on display at the village shop until 15 December. The planned play area at the school will include a stage, trail, climbing wall and artificial grass.